There has been a move towards tougher legislation, ambiguous terminology, lower thresholds and legislation allowing police greater rights, together with an escalation of militaristic forms of policing in recent years. Sarah Pickard, National Union of Students march, London, 2012. All rights reserved. Dissent and protest are on the rise in Britain, as well as in other advanced democracies. The organisers of protests, the reasons for protest and the nature of protest have all been shifting within the context of neo-liberalism, the fall-out of the global financial crisis and austerity. Traditional marches and demonstrations remain an important type of popular protest. However, there has been an increase of protest networks that are inventing creative direct-action repertoires, including short-notice events with the aid of digital media and a growth of ‘Do-it-Ourselves’ protest politics mostly youth-led. In parallel, there has been a notable growth in state repression of protest characterised by a distinctly punitive turn. In Britain, this has taken two main forms that together have created a more authoritarian environment, at odds with the right to freedom of expression and the right to freedom of peaceful assembly enshrined in the Human Rights Act 1998, which came into force in 2000. First, there have been substantial additions and amendments to legislation. Second, there have been important introductions and changes to policing methods. The legislative landscape pertaining to dissent has been transformed considerably since the 1980s (see Table 1). New criminal justice laws have been passed or amendment and existing laws drawn up ostensibly for other purposes have been applied to protests and protesters. The clear aim of successive governments through all these layers of legislation has been an attempt to dissuade and discourage protests, partly through the criminalisation of dissent. The key piece of legislation is the Public Order Act 1986, passed by the Thatcher-led Conservative Government after riots at the end of the 1970s and early 1980s that were followed by violent clashes during the year-long miners’ strike (1984-1985). As well as creating many public order offences, the law imposes various conditions on the organisers of public ‘processions’ (i.e. moving protests or marches) and assemblies. At the same time, it allows the police to prohibit marches and impose conditions on protesters. For critics, the obligations and restrictions contained in the law are an affront to civil liberties and an infringement of the human rights enshrined in the European Convention on Human Rights (ECHR). 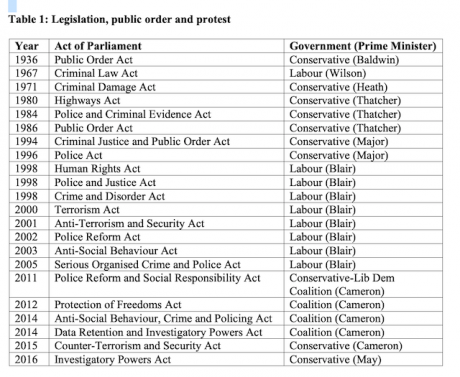 The Labour Government of Tony Blair also introduced decisive legislation affecting public protests in the form of the Crime and Disorder Act 1998, that gave more powers to the police and placed further restrictions on protesters. Crucially, this was achieved through the ambiguous and subjective notion of anti-social behaviour (ASB): “conduct which caused or was likely to cause alarm, harassment, or distress.” The legislation was not drawn up initially with the aim of controlling dissent, but it came to be used by the police in public protest situations. This led to anxiety that the police could further reduce freedom of expression and freedom of peaceful assembly. The statute was modified by the Anti-social Behaviour Act 2003, that gave additional powers to the police. Subsequently, the Conservative-Liberal Democrat coalition government further reinforced the legislative framework with the Anti-Social Behaviour, Crime and Policing Act 2014, which consolidated, expanded and bolstered law enforcement powers. For example, it allows the police to create ‘Dispersal Zones’ and it permits the pre-emptive dispersal of people – including peaceful protesters – for the purpose of “reducing the likelihood of alarm, harassment, or distress”. Crucially, non-compliance and breach of a dispersal order is a criminal offence that can lead to a prison sentence. A further controversial development within the legislative framework has been recourse to laws developed for the purpose of preventing terrorism being used to thwart, curtail or end peaceful protests. For example, the Terrorism Act 2000 (section 44) authorised police to ‘stop and search’ members of the public without the need for reasonable suspicion that terrorism had taken place or was likely to occur. Indiscriminate stop and search was deemed incompatible with the European Convention on Human Rights, which became applicable in the UK with the Human Rights Act 1998. Consequently, the then Home Secretary Theresa May was obliged to repeal section 44 of the Terrorism Act 2000. The parliamentary Joint Committee on Human Rights underlined in its March 2009 report Demonstrating Respect for Rights? that “counter-terrorism powers should never be used against peaceful protesters” and in a follow-up report, it once again deplored the “obvious overuse of section 44 of the Terrorism Act 2000 in recent years”. In 2010, in a case brought by a peace protester and a journalist, the European Court of Human Rights ruled the police powers of stop and search in the context of peaceful protest to be unlawful. This was because the police lacked sufficient safeguards to protect basic civil liberties, i.e. the right to freedom of expression and the right to freedom of peaceful assembly. Thus, indiscriminate stop and search was deemed incompatible with the European Convention on Human Rights, which became applicable in the UK with the Human Rights Act 1998. Consequently, the then Home Secretary Theresa May was obliged to repeal section 44 of the Terrorism Act 2000 and introduce “a new suspicion threshold”. Nonetheless, stop and search continues to be used in peaceful protest situations. Moreover, there has been a conflation of peaceful protest with terrorism, in part due to a very broad or loose or definition of ‘terrorism.’ For example, the Occupy London movement that camped out in the capital in 2011-2012 was classified by the City of London police as “domestic extremism” in a counter-terrorism document. For Liberty, the counter-terrorism laws are too broad, thus undermining civil liberties and human rights especially for peaceful protestors. Other statutory powers have been introduced into British legislation that allow the monitoring of groups and individuals. Notably, the Data Retention and Investigatory Powers Act 2014 authorised police and intelligence agencies to access telephone and internet records. This was described as “spying on citizens” by opponents, the well-known MPs David Davis (Conservative) and Tom Watson (Labour), and it was ruled unlawful by the High Court in 2015. First it was amended by the Counter-Terrorism and Security Act 2015, which enables “the Secretary of State to require communications service providers to retain an additional category of communications data, namely data that will allow relevant authorities to link the unique attributes of a public Internet Protocol (IP) address to the person (or device) using it at any given time.” It was then replaced by the Investigatory Powers Act 2016 that allows certain surveillance powers and certain safeguards to them. For example, the Occupy London movement that camped out in the capital in 2011-2012 was classified by the City of London police as “domestic extremism” in a counter-terrorism document. The considerable information gleaned through such means and others (see below) is held on various searchable police data bases, including the Police National Computer (PNC) and the Police National Database (PND) that are due to be replaced by the National Law Enforcement Data Programme that will “introduce new and enhanced data sets into LEDS such as, Biometrics, Images from DVLA & Passports, ANPR and analytical tools”. Other databases comprise IDENT1, the National DNA Database (NDNAD) and the Crimint (criminal intelligence) database used by the London Metropolitan Police Service (the Met). Strikingly, information is held on convicted criminals and suspected criminals, but also political campaigners and protestors (see below). In brief, there has been a move towards tougher legislation, ambiguous terminology, lower thresholds and legislation that allows the police greater rights to restrict the dates of marches, the routes of marches, the numbers of people permitted to march, the right to disperse crowds, to make arrests, to stop and search, to collect biometric data and to store information on searchable data bases. Furthermore, other policing methods have also been called into question within the context of policing protest. In recent years, there has been an escalation of oppressive and militaristic forms of policing used during protests. British police officers and most notably the Met have diversified their tools and strategies, which form a tryptic of policing methods that are far removed from traditional ‘policing by consent,’ a principle that dates back to the early nineteenth century. First, there is more covert and overt surveillance or monitoring, with information stocked on data bases. Second, there has been a growth in the physical methods made available to police officers, including containment (kettles), tear gas, tasers and water cannon, as well as the use of ‘unnecessary force’ and violence being used on bystanders and peaceful protesters. Third, police are using various practices to prevent people from protesting, such as mass arrests, pre-emptive arrests, detention and conditional bail. The overt and covert surveillance of peaceful protesters during marches is undertaken by different types of police officers, notably Forward Intelligence Teams (FIT), Police Liaison Officers (PLO), and Evidence Gathering Teams (EGT) (see photographs). During demonstrations, Forward Intelligence Teams observe and track participants, noting appearance, behaviour, communication, movement and associations. For Her Majesty’s Inspectorate of Constabulary (HMIC), “one of the tactics employed by FITs is to seek out persons likely to engage in disorder and follow them to monitor their actions. The purpose of this is to deprive the person of the ability to engage in disorder, due to the proximity of police officers. This tactic has been criticised by a number of protest groups as oppressive and constituting harassment of peaceful protesters”. 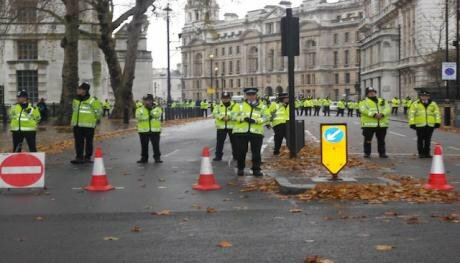 Netpol and other critics allege that Police Liaison Officers deployed during demonstrations and marches also fulfil a role of intelligence gathering, as explained by Val Swain in openDemocracy. Evidence Gathering Teams mostly photograph and film participants, which may involve identifying, spotting, following and monitoring particular people with the aim of preventing and detecting crime. This can be seen in the pictures shown here taken in November 2012 during a National Union of Students (NUS) march. According to Her Majesty’s Inspectorate of Constabulary (HMIC), “police use of overt photography raises significant human rights issues, notably the question of whether police action is compatible with the right to private life protected by ECHR.” This is all the more concerning, as images of peaceful protesters and bystanders not engaged in any illegal or provocative behaviour are also obtained and retained. The information and images are stocked on searchable data bases (see above) and ‘spotter cards’ are produced for identification uses. Such surveillance can be intimidating and have a deterrent or ‘chilling effect’ on peaceful protesters, thus preventing people from exercising their democratic right to peaceful protest. It may also encourage persons to cover their faces and resist police surveillance by other means. It creates a divisive ‘them and us’ atmosphere and represents a departure from traditional consensual policing. Images of peaceful protesters and bystanders not engaged in any illegal or provocative behaviour are also obtained and retained. Other surveillance tactics have included police operatives with fake identities infiltrating political groups, for example environmental activists, in order to carry out covert surveillance of law-abiding protesters and disrupt protests. Most disturbingly, there have been several cases of police officers involved in long-term intimate relationships with the targets of their monitoring, including at least two who fathered children and then disappeared. Some have acted as agent provocateurs by initiating, organising and encouraging civil disobedience. This all obviously raises considerable ethical issues and the infringement of civil liberties and civil rights. Regarding the militarisation of policing tactics in public order and protest situations, a contentious development has been the increased use by the police of containment or ‘kettling.’ This is the encircling of people (protesters, bystanders, observers) in a specific area (for example, a public square, a road or a bridge) by police officers who can then control the movement of the people contained. The people kettled are detained and deprived of their freedom of movement, sometimes for hours without having committed or being suspected of having committed any criminal activity. For example, police used containment on peaceful protesters at anti-G-20 Climate Camp in London, in April 2009. Subsequently, the High Court of Justice ruled that the Met had used undue force and that containment was inappropriate. 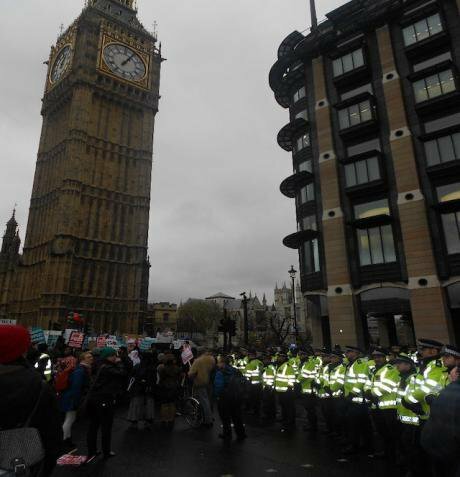 On 9 December 2010, the Metropolitan Police went on to use containment in Parliament Square and on Westminster Bridge for several hours into the night during protests (against the trebling of annual university tuition fees, higher education funding cuts and the scrapping of the Educational Maintenance Allowance). The people kettled are detained and deprived of their freedom of movement, sometimes for hours without having committed or being suspected of having committed any criminal activity. Containment is indiscriminate and inflammatory; it can be frightening and dangerous. Kettling permits the police to restrict the movement of those inside with the purpose of reducing potential disorder. But containment is also carried out to harvest personal information (for example, names, addresses, and fingerprints via mobile digital fingerprinting devices), making release contingent on the provision of information with intimidating threats of fines and arrest for noncompliance, although such requests are not officially allowed. There has also been an increase in the procurement and use of weapons by the police in the context of public protest, which raise human rights issues. CS spray (tear gas), for example, was used on UK Uncut protesters staging a peaceful sit-in against corporate tax avoidance, in a crowded area on Oxford Street, London, January 2011. Six members of UK Uncut sued the Commissioner of Police of the Metropolis, who was obliged to apologise for the use of “unnecessary and unlawful” “excessive force” when protesters were sprayed in the face at close range causing, “intense pain, momentary loss of sight, and feelings of panic and fear.” He also apologised for the police preventing people from “exercising their fundamental right to protest” and the Met awarded damages to the protesters involved. Another example of excessive force and violence taking place is when police officers, “use of the edge of a shield against individuals” as a “public order tactic.” There have been notable cases of excessive force being exerted on young protesters, such as on Alfie Meadows in 2010, which brought about the creation of the organisation Defend the Right to Protest (DTRTP). Tasers are ‘conducted electrical weapons’ or ‘electro-shock weapons’ that fire electrically charged probes, incapacitating the target. Following pilot schemes around the country, most police forces started using Tasers in 2009, including in protest situations. An upgraded more powerful version ‘Taser X2’ was authorised for use by police in England and Wales by the Conservative Home Secretary, in March 2017. Amnesty International and other organisations have raised concerns about the use of CS Gas and Tasers by the “trigger happy” police, for example, when West Midlands police officers dealt with a student sit-in at Warwick University in 2014. In January 2014, the Commissioner of the Metropolitan Police and the Association of Chief Police Officers commented that “ongoing and potential future austerity measures are likely to lead to continued protest” they expected water cannon to be required. A few months later, the then Conservative Mayor of London Boris Johnson purchased second-hand water cannon for the purpose of public order management in the capital (a first on mainland Britain). His Labour successor Sadiq Khan considered them inappropriate and wanted to sell them, but there have been no buyers. Last, another militaristic development in policing has been the authorisation for police firearms teams in London to deploy attenuating energy projectiles (AEP), also called baton rounds or rubber bullets. Importantly, such permissions were issued prior to student demonstrations against higher university tuition fees, for example, in November 2011. Neither water cannon nor rubber bullets have been used on protesters on mainland Britain. But their procurement is a clear illustration of the militarisation of policing methods in recent years. When amalgamated with other practices, such as mass arrests, pre-emptive arrests and pre-charge bail with exacting conditions leading to no prosecution, etc, they contribute to a repressive environment in Britain surrounding lawful dissent. Taken together, new legislation, amendments to legislation, the enforcement of legislation combined with the subsequent changes to policing tools and strategies since the end of the 1970s have resulted in the increasing militarisation of the policing of public order and protest in Britain. There have been successive challenges to legislation and policing methods in the UK High Court of Justice and the European Court of Human Rights with reference to the European Convention of Human Rights (ECHR), the Human Rights Act 1998. There have been successive challenges to legislation and policing methods in the UK High Court of Justice and the European Court of Human Rights with reference to the European Convention of Human Rights (ECHR), the Human Rights Act 1998. This raises crucial questions about what will happen to these fundamental checks and balances as Britain withdraws from the European Union. Moreover, it should not be overlooked that the repression of protest by the State through legislation and policing creates feelings of injustice and anger among young protesters that can be expressed through resentment and hostility towards politicians and the police. There are of course certain protesters and activists who are very provocative and aggressive towards the police and some are violent and break the law. However, this does not justify the increasingly authoritarian behaviour towards peaceful protesters many of whom are young. Sarah Pickard. Governing, Monitoring and Regulating Youth Protest in Contemporary Britain. In Governing Youth Politics in the Age of Surveillance. Grasso, Maria and Bessant, Judith (eds.). 2018. London: Routledge, pp. 77-90. 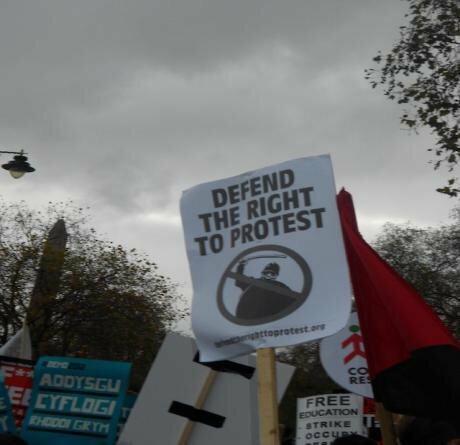 The photographs illustrating points raised in the article were taken by the author Sarah Pickard when acting as an independent observer on the 21 November 2012 National Union of Students (NUS) march in London.